Update 2015-02-13: Press release with revised agenda. Update 2015-12-23: Now with silent art auction! The visual beauty of the rivers in an art exhibit and silent auction, the geology on display by Dennis Price, and the remains of past people and cultures still visible along the river by Tom Baird, plus the winners of the logo contest for the Withlacoochee and Little River Water Trail presented by VSU art professor Julie Bowland, all in a workshop about two of our biggest WWALS rivers, Okapilco Creek, Piscola Creek, and other associated creeks, lakes, ponds, and swamps. Logo contest deadline now extended to January 15th, 2016! Tentative agenda: See the Press release with revised agenda. — Tom Baird, seen above presenting at VSU for WWALS three years ago. —Dennis Price, professional geologist, seen here testifying as an expert witness at the October 2015 hearing in WWALS v Sabal Trail & FDEP. 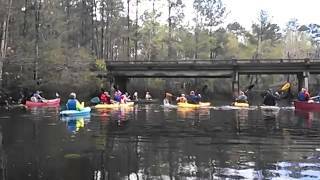 Come paddle the Little River with WWALS at the January Outing from GA 122 to Lawson Millpond Road, betweeen Hahira and Barney, January 16th 2016. Coming up in May is the annual BIG Little River Paddle Race; stay tuned for details. See the upcoming outings and events for numerous listings and details. Now with Meetup in addition to facebook events! 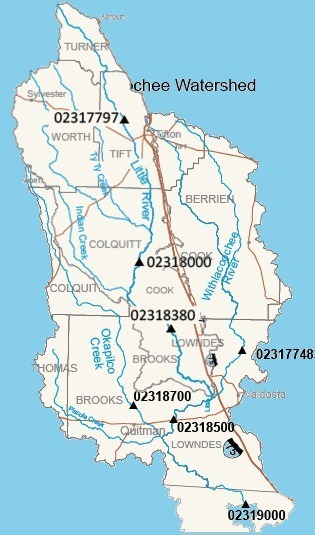 This entry was posted in Blueway, Education, River and tagged archaeology, beauty, Blueway, conservation, contest, education, Little River, Little River Water Trail, logo, north Florida, Okapilco Creek, Piscola Creek, river, south Georgia, students, Valdosta State University, VSU, watershed, Withlacoochee and Little River Water Trail, Withlacoochee River, Withlacoochee River Water Trail, WWALS, WWALS Watershed Coalition on December 16, 2015 by jsq.